Dr. Joseph Savoie, president of the University of Louisiana at Lafayette, announced plans today to implement state budget cuts across campus. 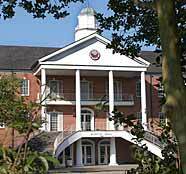 The plans come after UL Lafayette’s state budget was cut by $4.3 million in January along with an additional $7.5 million cut following the legislative session that ended in June. The university must also absorb $2.9 million in state-mandated, but unfunded costs – for a total year-to-year budget reduction of $14.7 million. New fees and tuition increases will generate $3.2 million, so the net reduction is $11.5 million for UL Lafayette’s $99 million budget. Savoie said the university has two choices in dealing with this budget reality. Savoie acknowledged the work of nine UL Lafayette Budget Task Forces that he created last January in anticipation of possible budget cuts. These Budget Task Forces were charged with developing short-term and long-term cost savings and additional revenue. He noted that several task force recommendations have been incorporated into UL Lafayette’s budget. Those task forces were composed of representatives from throughout the university’s community. “ Our goals were to protect our core academic mission, minimize the impact on our students, and protect our faculty and staff, who are our most important asset in providing quality academic services,” he said. The university administration based the budget plan on three primary elements: cuts to meet actual budget reductions, cost avoidance measures to reduce operational expenses and increased revenue generation. • reducing maximum support staff merit increases from 4 percent to 2 percent. Other options for cost savings include consolidating or eliminating programs with historically small participation, merging administrative and academic departments, decreasing the number of dropped classes each semester, eliminating waste, negotiating bulk purchases, maximizing teaching loads and lab usage, and increasing class sizes where appropriate. Savoie said the university will also invest in efforts to increase enrollment by implementing aggressive and sophisticated recruitment efforts, increasing fund raising, providing incentives for increasing research proceeds, partnering with private enterprises to maximize the commercial potential of select university assets and increasing revenue from facility rentals.